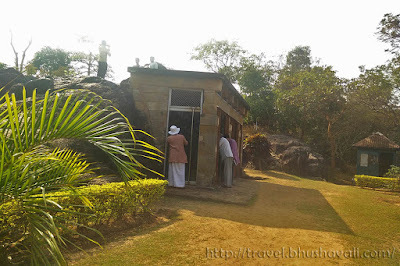 To begin with, Jain caves with exactly same name Udayagiri is also in Odisha, but with a solid 90km distance between them, which is why specifying this title as Buddhist sites! 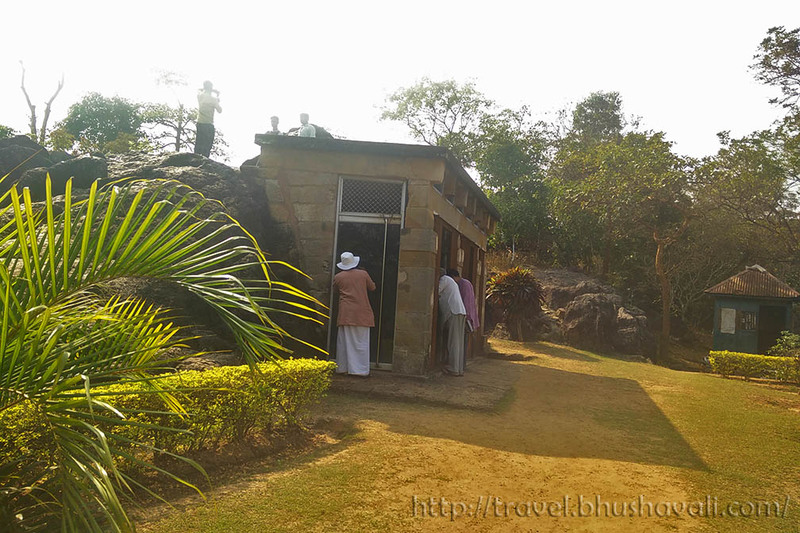 Read about the Jain Caves here! The first stop was Lalitagiri. The original name is Naltigiri. 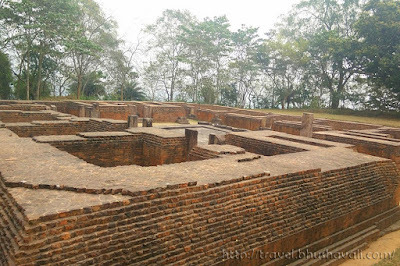 Clay seals discovered here indicate that the place was a monastery meant for all Buddhist, irrespective of their sects! Today the main sections are the chaitya, vihara and stupa. The vihara consists of 4 monasteries, in one of which is the half of a Buddha! Remember the miniature of similar structure, we spotted near Poompuhar in Tamil Nadu? 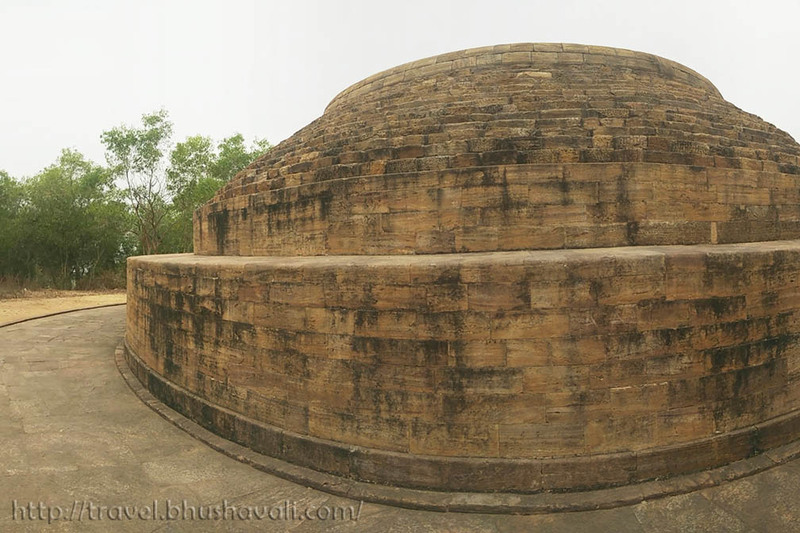 The chaitya is this apsidal (rounded back / similar to ‘gaja prashta’ architecture in Dravidian temples) architecture. This is the only such structure in Orissa. The inner core of this structure is the oldest and belongs to 2nd / 3rd C CE. This has several monolithic votive stupas all around it and actually, scattered all all over the site. Some of these also have an inscription on them! There is an on-site museum here that has several sculptures of Buddha and Bodhisattvas, belonging to 2nd - 13th C, retrieved here during excavations. Behind the museum is the path that leads to the Stupa atop a hillock. This had 3 caskets in it of which one was made of gold and has a bone relic (today preserved in the state museum). The view from atop here of the agricultural lands is just splendid! Further ahead is a single huge monastery with a chlorite gateway which is so beautifully carved! Spot the fellows climbing and swinging on the vine??? I stood here for almost probably half an hour, just mesmerized by the intricacy and the imagination that went behind in sculpting each and every action figure! The sanctum sanctorum has a huge Buddha, but all the sculptures (of 5th-13th C CE) retrieved in Ratnagiri excavations, have been kept here ranging from miniature work to one whose head was as big as me!!! Here’s also another doorway in 7 parts again filled with miniature work all over it, incl children, monkeys, elephants, vines, nagas and a few erotica as well! Beside are 2 smaller monasteries. Further ahead is the Mahastupa (8th-10th C CE). Behind it is the much later built, Mahakala temple. Our final stop for the day was Udayagiri. To get to the main stupa here was a bit of a walk!!! From the gate, at one point is a square, filled with sculptures excavated here. A short walk from here through a green dirt track takes you to the stupa. On 3 sides of the stupa are majestic sculptures of seated Buddha. Behind this is the monastery and the whole set up, with the Udayagiri Mountains forming the backdrop it was one gorgeous site! There is a large Buddha in the sactum sanctorum of this site as well. Here again, the gateway of the monastery blew my mind. Unlike Ratnagiri, this wasn’t made of Chlorite. But the detailing was as much with flying apsaras similar to Konark, fellows climbing vines, elephants etc. That’s my friend’s hand and finger nail beside the miniature to give you an idea!!! See the eyes, nose and lips of a human whose face is smaller than our fingernail, all sculpted a few centuries ago??? Btw, here’s a tip for these 3 sites - beware of monkeys. The 3 places are just filled with so many monkeys!!! 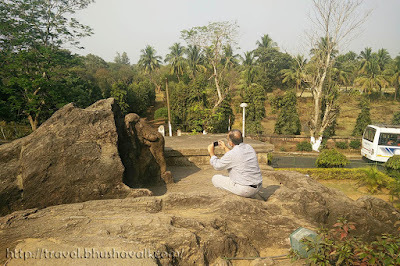 On a different day, we set off to Puri and on the way stopped at Dhauli. 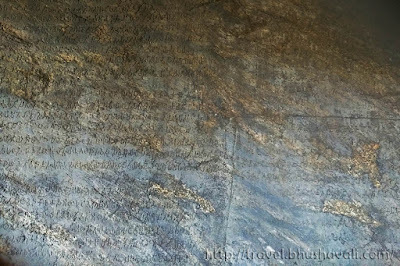 All that Dhauli has, is a rock, with an expansive inscription by King Ashoka! It’s believed that the Kharavela inscription in Udayagiri Jain Site is exactly opposite to, facing this! I don’t know how far real is it? The inclination angle to the latitude and longitude on both sites has to be measured to see if it’s for true and if you find it, let me know!!! A pathway from here atop leads to a half-sculpted elephant! For those who have heard of Samrat Ashoka, would know of his change of mind and conversion to Buddhism after he saw the bloody outcomes of a war! 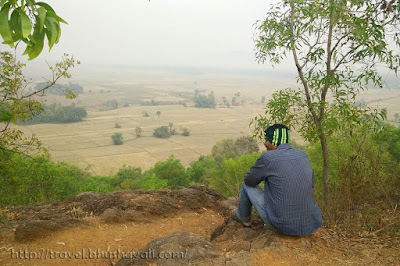 That Kalinga war happened close to Bhubaneswar and Dhauli is where he had the change of mind. 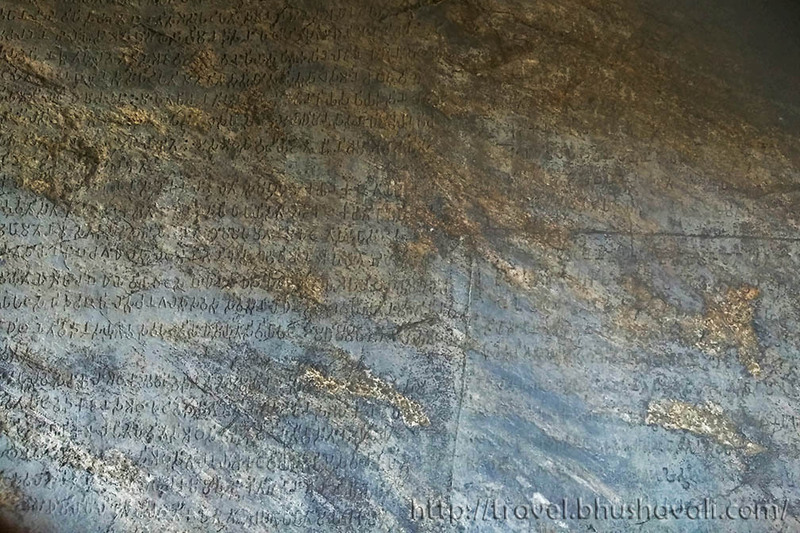 The inscription is in Prakrit language in Brahmi script. There is a board here by ASI that briefs about the content of this inscription. Today the entire rock face is protected with a steel shutter and glass to protect it from the adverse effects of nature. Hotels at all price points available in Cuttack. The nearest hotel run by Orissa Tourism Development Cooperation (OTDC) is Panthanivas Cuttack, Paradeep and Dhauli. The prices here begin at ₹700 at Dhauli for non-AC double room and ₹1350 at Cuttack & ₹1200 at Paradeep for AC double room incl breakfast & lobby wifi. Nearest OTDC run 4 star resort is Toshali Resort in Ratnagiri & Udayagiri with prices beginning at ₹4500 for AC double room incl breakfast. Wow this looks like such a pretty itinerary. I am dreaming of visiting India and the buddhist circuit would be just perfect. It looks like a very spiritual place to travel to. What a fun find! I love how intricate all the carvings are. So exquisite and it's like finding fun little presents all over. I have a hard time wrapping my head around just how old places like these are! 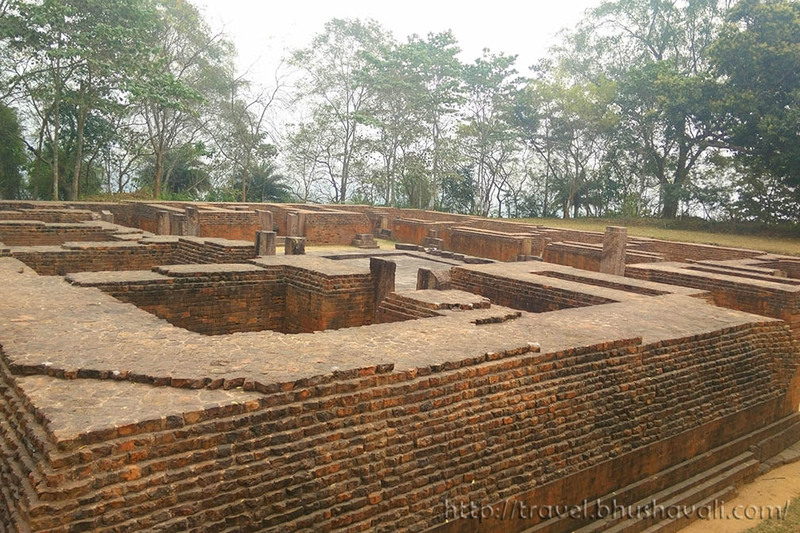 Odisha looks like a very historical place. I have only seen these kinds of carvings in movies never thought the existed in real. I wish I could visit this place. Your post is about a part of India I would like to visit. 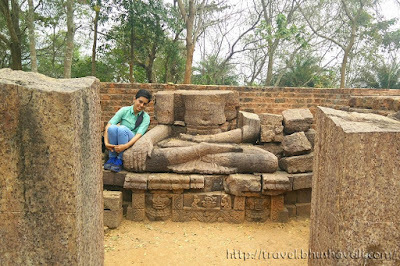 I have travelled to a handful of Jain sites in southern India, including the magnificent temple at Shavanabelagola. What an amazing place to explore! All those carvings are amazing. That must have been really great to see in person! Odisha is enchanting! Looks very un-commercialized yet. I just could not place it. In which part of India is it located? Wow... wonderful exploration! I really want to do this circuit. I first heard of Udaygiri when I visited the Udaygiri in MP near Sanchi. The name confusion helped me find out about this gem. The large Buddha head you are standing besides is something really evocative. All these date back to the Mauryan era, thus making them one of the most ancient surviving monuments in India! Those Google maps co ordinates are so useful. I was guessing these Buddhist monuments would be in northern India. It's interesting there is so much in the east as well. I love your picture stood next to the Buddhas head, it shows how huge the sculpture is! I never heard of this place but I am loving your blog because you are always adding something new on the off-beaten track. This is awesome. I love your close up pictures with all the details of the sculptures! I really like to visit this kind of place. The sculptures looks so stunning and amazing. and it seems you are having so much fun there. Wow! The carvings look so beautiful and detailed. I wonder how much time it took for them to be finished. Aren't there a lot of tourists in the place? It seems abandoned and empty. Love the carvings and how detailed they still are. India is full of these cool places! Your images and insights are so interesting. The caves are so spectacular. The overhead view and details are stunning. The details must have taken so much work to create. I had visited the Diamongd Triangle (Lalitgiri - Ratnagiri - Udaygiri) a few days back and was equally enthralled. Aren't they simply wonderful?? These hidden treasures should be explored more. I feel so proud to be an Indian. Odisha has many surprises to offer. Such rich heritage. By the way, Puri beach is absolutely gorgeous too. The one with the Chlorite gateway is very beautiful! How I wish I'd be able to visit them. Amazing place, i love the huge places because it have alot of stuff to explore and this one just amazing. I wish i could visit it! These places are really very fascinating. Unfortunately despite a few visits to Odisha we have not yet made it to these places. 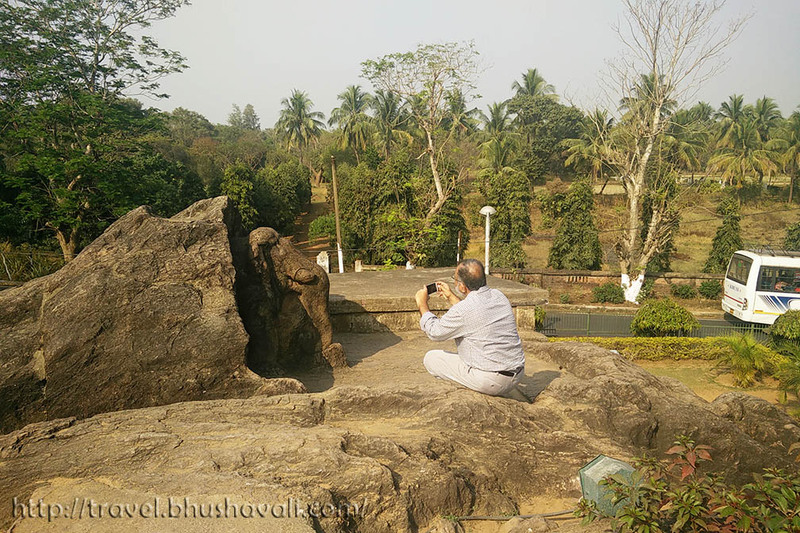 We were in Bhubaneshwar few months back and had planned to cover these places, but owing to some personal commitment had to drop the plans.Dhauli of course is a place where history seems to have taken a pause. What a special place to visit! I very much liked picture of Udayagiri monastery gateway with with flying apsaras. India has so much to offer. Thanks for sharing! The detail in that stone is incredible. It must have been amazi g to see. I would love to vusit one day! Those ruins are particularly interesting. That is what's great about India---it's so full of life, culture, and history. We would love to visit India soon!